Don't let crooked Blinds or Shades detract from your window decor. Don't let a minor repair stand in the way of your window treatments looking great. 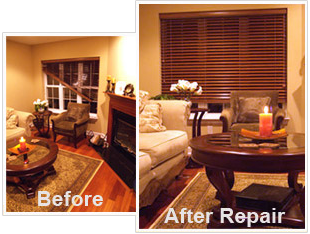 Repair your blinds & shades for a fraction of the cost of buying new ones. All work done in our New York workshop. Most repairs completed in 2 days. The home decorating industry has created an amazing variety of beautiful window coverings, but this has also created an even more amazing number of unique and special parts. We have access to all these parts, so there is no need for you to hunt through the parts maze or do the repair labor yourself. All work is performed in-house at our Nanuet, NY facility in order to ensure minimum handling, control costs, protect your investment, and to provide the quickest possible turn-around. Use our Inquiry Form to describe your needs and obtain pricing, or other information. Click here for an online inquiry. We do custom fabric slip covers in the Rockland County area of New York. Foam rubber can be custom cut to your specifications and shipped. Fill out the inquiry form to be contacted regarding your needs. 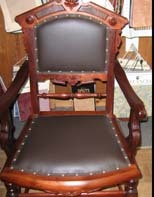 We specialize in doing expert repairs for you. Leave the difficult work to us. or complete the inquiry form. "I love the way my house looks with all my custom-made blinds. My cornices are so unique and the fabrics are really special. I get tons of compliments on my window treatments. "I’ll always recommend Blinds Unlimited to my friends. Jerry is very professional and his installation staff were courteous and helpful. "Thank you for your quick and responsive service. The shades really make my home look special. From the beginning of the order to the end when my shades were installed it was a pleasure working with you and your crew. "Jerry, thank you for repairing my wooden blinds. Without your service I would have needed to get all new blinds for my living room. As my living room has 7 windows, you saved me a bundle and the hassle of picking new blinds. "Jerry, what a relief it was to hear you can repair my shades bought decades ago. It really means a lot to me. "Hi Jerry, after having spent hours looking for just the right blinds at the major retailers (including Home Depot) without success, dealing with you and your installers was a pleasure. Moreover, when including installation cost you were much cheaper. Your service was first class and you have my business going forward. "Thanks Jerry for your quick service. Everything worked out as promised. Moreover, your prices were much lower then everyone else’s. "We thought that decorating our new home would be a complex and tiresome process. With your help all the blinds and shades were installed to match our decor with ease. Your selection was great and the prices within our budget. Thanks again.